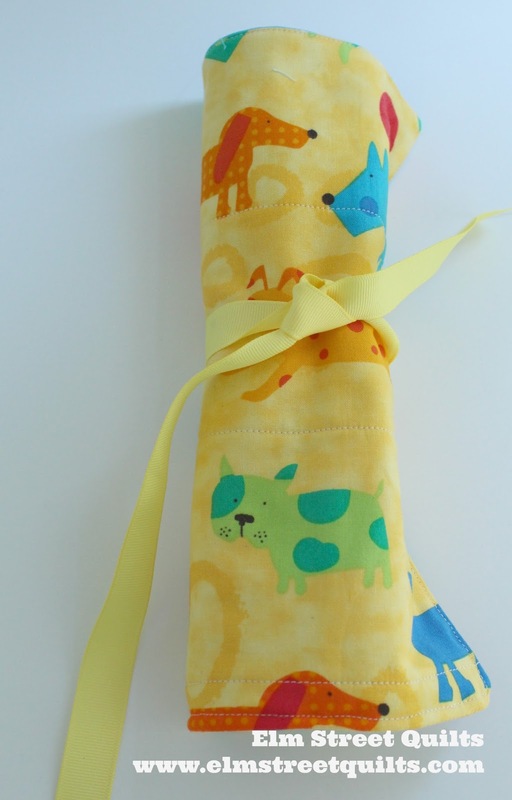 What a great excuse to pull out fun fabric from your stash and put it to good use. 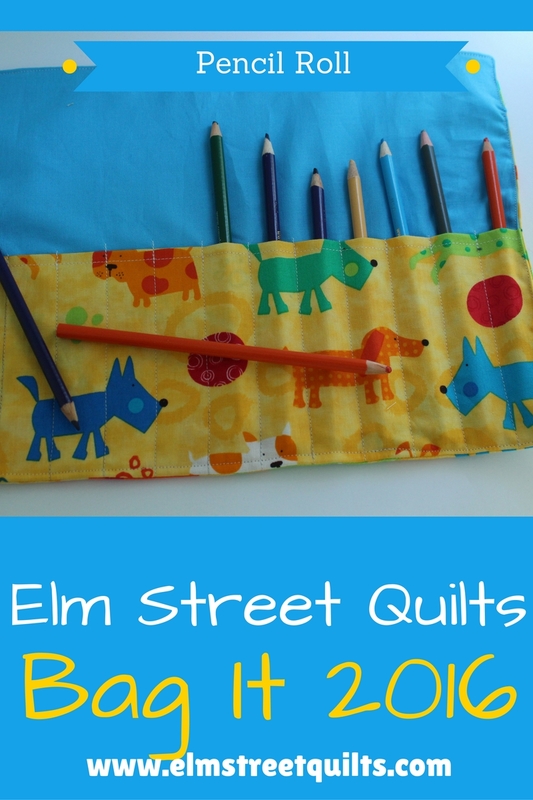 Make a pencil roll for each of the kids and the adults on your holiday list. Note - for directional prints the measurements are listed as height by width. So you'll need a piece 10'' high by 12 1/2 '' wide. Fold pocket fabric in half, press and sew a line of tops-stitching close to the folded edge. Pin the pocket to the lining fabric, aligning the bottom edges. Sew on each of the marked lines. 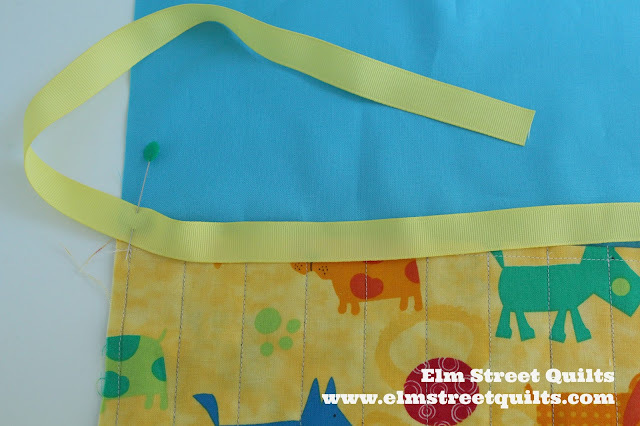 Start at the top of the pocket and back-stitch to secure stitching. As necessary, remove any of your pen marked stitching lines. Iron fusible fleece onto wrong side of primary fabric. Notice how the fusible is framed by the fabric in order to keep it out of the seams to reduce bulk. 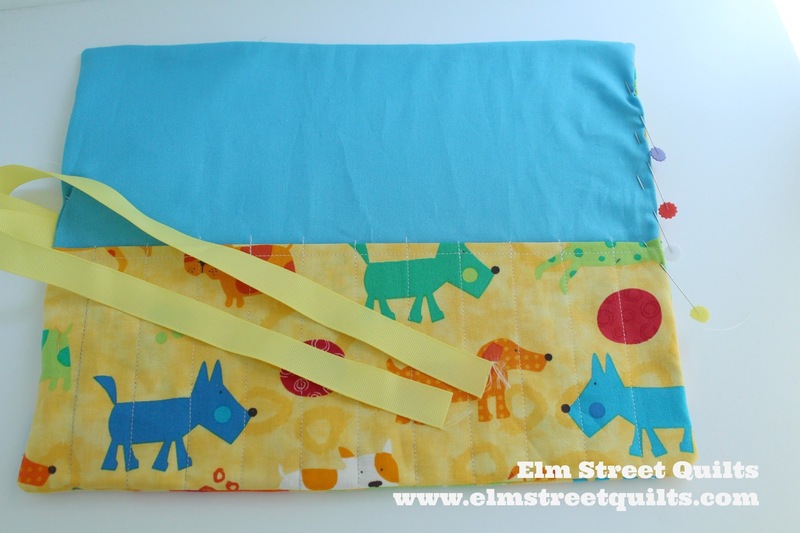 Do some light quilting - this sample had some minimal straight line quilting. Fold ribbon in half and sew to left edge of pocket - lining unit. Pin lining plus pocket unit and the primary unit right sides together. Sew around all four sides and leave an opening about 3 - 4'' for turning on the side of the unit without the ribbon. Make sure the ribbon is tucked inside - maybe in one of the pockets you made - so it doesn't get caught in the stitching. Turn inside out. You can tug on the ribbon to help things get started. Fix corners and press if needed. Fill up with your pencils and enjoy! 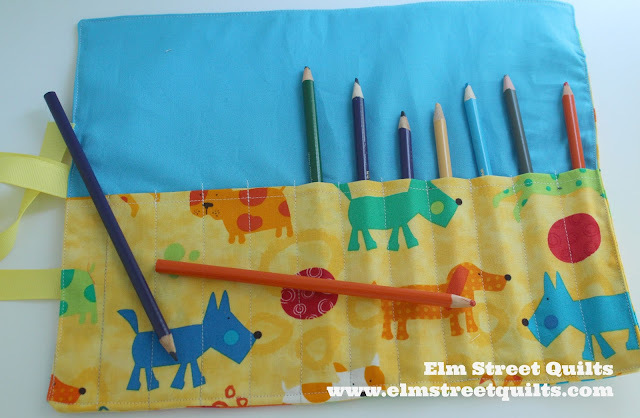 This pencil roll was designed for 12 pencils. Need a bigger one? Essentially you want the width to be 1 '' for each pencil plus 1/2'' for the seam allowances. Pull out all the novelty fabric from your stash and make one for everyone who likes to color, regardless of their age! That a cute gift idea and wonderful tutorial. Thank you so much for linking up! So cute! You could easily adjust the size of this and use for knitting and crochet needles, right? Adorable project. Thank you for sharing. Such a cute project, thank you for the tutorial!